Learning how to get free Amazon gift cards can help you pay for items throughout the year. We love to shop on Amazon and love saving money on items we normally buy. Earning free Amazon gift cards is almost as good as getting paid in cash because you can use it on anything Amazon sells. Although you won’t become rich from earning free Amazon gift cards, it’s a great way to save money on everyday expenses or a larger purchase. Lastly, Amazon gift cards are a great way to save money on gifts or can be given as a gift. If you want to know how to get free Amazon gift cards fast, below are 25 legit ways to do just that. The best way to get free Amazon gift cards is through online surveys. You won’t get rich taking surveys, but many of the best paid survey sites offer gift cards for your time and opinion. Although you can get cash, many people opt for gift cards. Many brands and marketing firms value your opinion on their products and services. This often comes in the form of taking a short survey or asking you to test their product. These are the best survey sites that let you earn free Amazon gift cards online. Survey Junkie is one of the best survey sites to make money because it’s so simple to use. It’s one of the oldest survey sites, starting in 2005, and boasts over three million active members. It’s pretty easy to start earning money with Survey Junkie. You just open an account, fill out a quick profile, and start taking surveys. Once you hit the 1,000 point mark, which is equivalent to $10, you can start redeeming points. You can redeem cash via PayPal, or you can get Amazon e-gift cards, whichever you prefer. Survey Junkie lets you take surveys on your smartphone or desktop. All you need is access to the Internet to use the Survey Junkie platform. Check out our Survey Junkie review to read more about how the platform works. Pinecone Research is one of the highest paid survey sites in the market. They pay $3 per completed survey and they also pay you $3 when you open an account. Pinecone Research is a little pickier in their selection process. Unfortunately, you can only start an account by clicking the above link and not through their public site. Pinecone specializes in product testing over straight surveys since they want to test products before they make it to the public. You can redeem points for cash or Amazon e-gift cards, and every 100 points equals $1. Check out our Pinecone Research review to learn how to increase earnings on the platform. Ipsos i-Say is one of the oldest online survey sites in the market. The company started in 1975 and specializes in political-based surveys, but they offer plenty of other surveys as well. What we love about Ipsos i-Say is their low minimum redemption amount. You can start redeeming rewards once you hit 500 points, which equals $5. You can redeem points for cash or Amazon gift cards, which are delivered instantly. Each survey you complete earns you loyalty points and also enters you into drawings to earn bonus points or other awards. Global Test Market is one of the biggest paid survey sites, having over five million members and spanning 200 countries. It’s relatively simple to join, too. You open an account and fill out a brief profile, and they use that information to match you with the appropriate surveys. Global Test Market lets you make money answering surveys on a number of topics, from eating out to cars to shopping and more. Additionally, many of the surveys also let you enroll in weekly or monthly cash drawings. Many of the surveys pay between 10 and 100 points, and the minimum redemption amount with Global Test Market is 1,100 points (equal to $50). You can redeem points for PayPal cash or Amazon gift cards. Fortunately, you don’t have to do point to cash conversions with InboxDollars. They pay in cash or gift cards so you know exactly what you’re going to receive. Each task is worth a different amount so you won’t always earn at the same frequency. The one downside to InboxDollars is the minimum redemption amount of $30. Fortunately, they offset this by paying a $5 signup bonus to help you start earning right away. Check out our InboxDollars review to learn about how the platform works. OneOpinion may not have the name recognition that Survey Junkie and others have, but it’s one of the most popular online paid survey sites. This is due to their great customer service and ease of redeeming funds. OneOpinion lets you make money taking surveys and testing products. OneOpinion operates on a points-based system and the minimum redemption amount is 25,000 points, which equals $25 in cash or Amazon gift cards. Most of the surveys with OneOpinion pay out 1,000 to 5,000 points so you can start earning quickly. If you qualify for product testing, you can earn even more points. The Harris Poll is one of the most well-known online survey sites. The Harris Poll has been around for over 50 years and is best known for political polling. However, they also conduct surveys for a variety of other topics. The Harris Poll pays you to take surveys and gives you opportunities to join focus groups to increase your earnings. You can redeem points for cash or gift cards, including Amazon. You can earn money and free Amazon gift cards with PrizeRebel by taking surveys as well as signing up for free trials and liking their social media platforms. It’s super simple to join PrizeRebel. They claim you can have your account open within ten seconds and you can start taking surveys instantly. PrizeRebel has a minimum redemption of $5, and every 100 points equals $1. Opinion Outpost is another well-known online survey site. One of our favorite features of Opinion Outpost is the fact that they offer seven different payment options, from cash to gift cards (including Amazon), so there’s plenty of options to choose from. Opinion Outpost has a relatively low minimum redemption amount of $10, but you can redeem gift cards starting at $5. As with other survey sites, completely fill out your profile when opening your account to ensure you get the most opportunities you can. The best part of Opinion Outpost is how quickly they process payments. In fact, they’re one of the fastest companies to do so. When you request funds, they’re moved instantly to your PayPal account – assuming you don’t want a gift card. YouGov is one of the more unique survey sites around. The primary purpose behind YouGov is to provide individuals with an opportunity to sound off about their views on politics, spending habits, what television shows they watch, and what retail brands they use. YouGov uses this information to provide statistics, which they publish daily on their site, to help companies and institutions better understand how to support individuals. However, YouGov doesn’t only focus on current events. They also pay you to take surveys and pay out a bonus of 2,000 points when you become a user. You can convert points for cash or Amazon gift cards, with many gift cards available at the $5 redemption mark. We love sites like these since it increases earning potential. MyPoints has been around since 1996 and is simple to start using once you open an account. You can redeem points for cash or Amazon gift cards. The minimum redemption amount is $5 for gift cards. EarningStation lets you can earn money in a variety of ways. Not only can you earn money by taking surveys, but you can also earn money by watching videos, playing games, and even purchasing certain Groupon offers. EarningStation is a bit unique in that they offer you an incentive bonus if you earn points for ten days in a row. Additionally, EarningStation only offers payment via physical gift cards for Amazon, and others, and not cash. This isn’t a deal breaker since many of the higher paying survey sites do the same. Do you want to earn $1 Amazon gift cards? If so, then InstaGC is the survey site for you. Many other survey sites won’t let you redeem points until you reach $5, $25, or $50. Another unique feature of InstaGC is they’re open to not only U.S. residents, but also residents of Canada, Europe, India, and Japan. National Consumer Panel (NCP) isn’t your typical online survey company. Instead of receiving opinions via surveys, they want insight on shopping trends. When you open an account with National Consumer Panel, you use their app to scan items you buy at the store. If you don’t have a smartphone, NCP will send you a handheld scanner to use. The information you scan gets sent to NCP. You earn points for each barcode you scan, and these points can be redeemed for cash or Amazon gift cards. Springboard America is a newer online survey site, starting in 2009. Our favorite part of Springboard America is that you get entered into a $1,000 drawing just for opening an account. Springboard America is a points-based survey system where every 100 points equals $1. Most surveys range between 50 and 500 points. They do have a higher minimum redemption amount of $50, which you can get in cash or gift card to a variety of different retailers, including Amazon. Online surveys aren’t the only way you can earn Amazon gift cards for free. You can also earn gift cards through using these cash back shopping apps. Ibotta rewards you with money back on in-store purchases. This app is great to use when you’re grocery shopping because it lets you search for rebates on items that interest you. When you’re in the store, shop as you normally would, save your receipt, and upload it to Ibotta to verify your purchase. Ibotta redeems your rewards via cash through PayPal or Venmo, or you can choose to get a free Amazon gift card. Gift cards to other retailers are also available. You can check out our Ibotta review to learn more about how it works. Ibotta lets you earn rewards at over 350+ retailers, and also pays you $10 when you open an account. Shopkick pays you not only when you buy products at a store, but they also reward you for scanning barcodes. You also earn points, which they call “kicks”, when you record prices from online stores, as well as when you watch sponsored videos. The Shopkick app is unique since you can earn kicks without having to buy anything. You won’t earn as many points, but you can still earn free Amazon gift cards without having to spend anything. Simply download the Shopkick app for iOS or Android, enable location in the app, and start scanning bar codes when at the store to earn points to redeem for gift cards. If this looks like your normal list, BerryCart is the shopping rebate app for you. BerryCart works similar to Ibotta. Scan your receipt when you’re done with grocery shopping to earn points for available rebate items. Those points can be redeemed for cash or gift cards, such as Amazon. You can earn free Amazon gift cards online with little effort. Below are the top apps that pay out in Amazon gift cards. Swagbucks pays in cash, or you can redeem points for gift cards including Amazon. Swagbucks even pays you $5 when you open a new account. You can also earn points for referring your friends and family members to Swagbucks. About 400-500 points will earn you a $5 gift card; 2,500 Swagbucks will earn you a $25 gift card; and 5,000 points will earn you a $50 gift card. Bing really wants people to use their search engine – so much that they’re willing to pay you in Amazon gift cards just for using it. When you sign up for the Microsoft Bing Rewards program, you can earn points for using the Bing search engine regularly. You can then redeem the points you earn for Amazon gift cards. Do you have free time and like to try new things? If you do, you can download and test apps through AppNana to earn points you can use to redeem to gift cards for a variety of vendors, including Amazon. If you’re nervous about having too many apps on your phone, don’t worry. You don’t need to keep apps you test on your phone because after you’re done with testing, you can delete the apps and still earn points. The best part is you can redeem points in $1 increments for Amazon gift cards. The best way to get free Amazon gift cards fast is directly from the source. 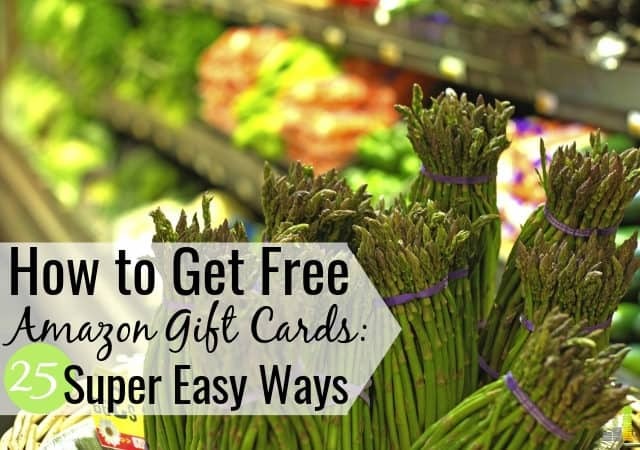 Amazon provides a number of ways to earn gift cards for your loyalty or doing simple tasks. Amazon provides you with a quote for your used items and sends them to a third party merchant. In exchange, they provide you with an Amazon gift card based on the value of your item(s). This is the easiest way to earn free Amazon gift cards. If you have a current gift card and want to add at least $100 to it, Amazon will give you an additional $10. This may not be the most money, but if you were already planning to reload your Amazon gift card, it makes sense to get some extra cash for what you’re doing. Did you know that Amazon offers coupons to buy different products? It’s true! These coupons usually allow you to take an immediate discount on an item. However, in certain circumstances, you can defer the discount and take it in the form of a gift card. Amazon Coupons are often found in the Grocery and Health sections, so you should check those sections if you shop on Amazon frequently. Do keep in mind in order to find the best opportunities, you need to be an Amazon Prime member. Amazon Mechanical Turk is an interesting site that allows you to perform certain micro-tasks for compensation. All the small tasks require human intelligence and are called HITs. Tasks include conducting research, transcribing audio recordings, or finding images. U.S. workers can transfer their payments for tasks to their Amazon payments account or take payment in the form of free gift cards directly from Amazon. How long does it take to earn an Amazon gift card? Most of the activities listed take 15 minutes or less. Some of the activities are tied to things you may already be doing, so it’s relatively simple to earn free Amazon gift cards quickly. Are online surveys the best way to get free Amazon gift cards? While online surveys are the most common way to get Amazon gift cards, they’re not the only way. As you can tell from our list, there are other ways to earn Amazon gift cards for free – some which you may do on a regular basis. Find what works best for you and take advantage of the survey sites that have the highest payout and lowest redemption requirements. Who can earn free Amazon gift cards? Each platform has its own requirements. Every item on our list is available to U.S. residents and some are open to international residents. Most of the platforms require you to be at least 18 years old, though some allow those as young as 13 to join (with parental consent). What is the smallest available gift card amount? A handful of apps and survey sites allow you to start redeeming points at the $1 level, although some go as high as $25. 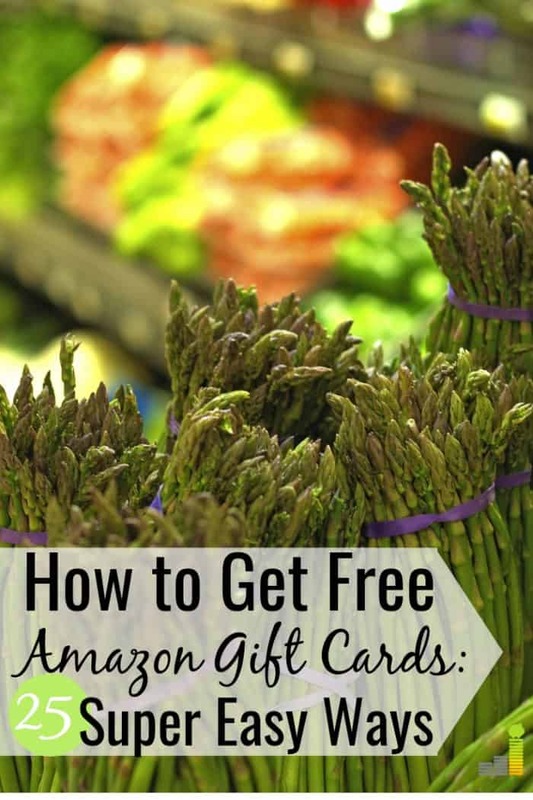 In most cases, you can start redeeming points for free Amazon gift cards at the $5 level. Many sites also don’t allow you to earn more for scaling up what you redeem. For example, if it costs 1,000 points to get a $10 gift card, it won’t cost 2,000 points to get a $25 gift card; you’ll need 2,500 points. Keep in mind that lower threshold apps and survey sites allow you to earn gift cards quicker than a site that has a $25 or $50 minimum redemption amount. How are Amazon gift cards delivered? In most cases you can receive e-gift cards that are sent to your email address. Some apps only offer a physical gift card option, but those are few and far between. Amazon gift cards are highly sought after and there are many services available to let you earn them. If you shop on Amazon frequently, gift cards can be as good as cash to help you save money on your purchases. Thankfully, there are many ways to earn free Amazon gift cards online – many of which you can start right now! How often do you shop on Amazon? What’s your favorite way to earn free Amazon gift cards? What’s one of the best deals or ‘finds’ you’ve snagged on Amazon? Right? Everyone could use a free Amazon gift card 🙂 Glad you liked the post! Receipt Hog is another app that rewards you with Paypal or Amazon cards. You have to take photos of your receipts from various stores. Just takes a minute, and an easy way to earn. I just got $25 in my Paypal account a few weeks ago, and almost have earned enough “coins” for a $5 reward already. I’ve never heard of that one. Good to know!